What's So Digital About Literacy Anyway? 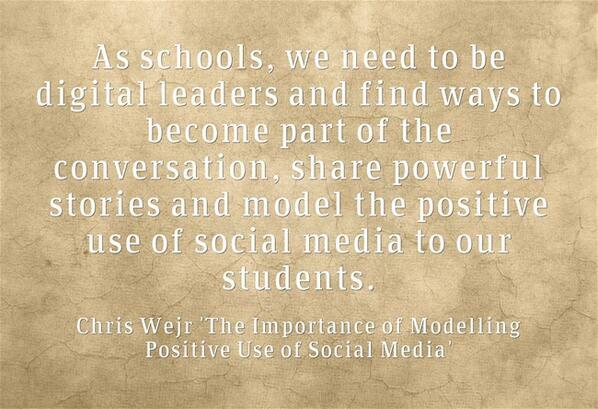 Much like leadership offline, students and adults can LEAD others in how they interact and treat each other online. When we put our heads in the sand and ban social media, we miss a huge opportunity to showcase and tap into digital leadership and model a positive online presence. This got me thinking about some of the other things that we may do personally online , but not necessarily model all the time in school. One such practise is that of reading and responding online. So often students are told to use tracks and be active readers, to write regular journal reflections, but this usually starts and stops at the physical book. When are students getting the same opportunity to read and respond online? Digital literacy enables students to critically engage with technology, forming an awareness of how social and cultural understandings can shape how information and meaning is conveyed. It allows them to communicate and represent information in different contexts and to different audiences by re-contextualising their knowledge. The reality though is that digital literacy is many different things to many different people and is constantly changing. +Doug Belshaw elaborates on this in his thesis on digital literac(ies). The best way, Belshaw suggests, of understanding digital literacy as an ever evolving set of subjective practises defined by contexts, rather than as some sort of stagnant concept. The most important thing is often the actual "process of coming up with a definition of what constitutes ‘digital literacies’", rather than the actual definition itself. Associated with this, Belshaw identifies eight interrelated elements which each play their part when it comes to digital literacies. These are not things in themselves, nor do they all come into play with each example, rather it is all dependant on context. For a more in-depth explanation of the each of the elements, see Belshaw's slideshare. Although we all may have different ideas as to what each of these steps mean, I will use them to provide a simple framework on which to discuss the whole affair and what it means to read online. The first place that most people go when searching for information is the search engine. In addition to simply typing in the request as is, there are many ways of emphasing words or using various filters to focus these searches and requests. For a great resource in regards to searching online, see +Richard Lambert's 'Digital Search Progression of Skills'. On the flip side, a lot of content we find online, in some way of another, actually finds us. The most obvious place we go to are sites and spaces that we trust. This includes news sites of one kind or another, often news of a specific nature. In addition to this, there are those sites and applications which help find information for us based on our history and preferences. This can include 'following' or 'liking' other users or pages on such sites as Feedly, Pinterest, Edmodo, Educlipper Youtube, Diigo, Google+ and Twitter, or news aggregation applications, such as Flipboard and Zite, which adjust the content based on your choices and interests. Services such as IFTTT and brower add-ons also make it easier to capture this content. One of the biggest problems with dealing with digital content is what you do with it once you have found it. One of the catches with mediums like Twitter and Feedly is that they are not always about reading everything in the moment. Applications like Pocket, Dropbox and Google Drive allow users to properly digest content at a later date across any device. Associated with capturing online content is the act of organising it. Sites like Diigo, Educlipper, Youtube, Pinterest, Evernote and Delicious allow for the curation of content. This often involves categorising and tagging, as well as adding annotations and comments. Whether it be commenting on a blog, repinning an image, liking a post, sharing a link, there are many ways to contribute ideas and information to keep the conversation going. One of the biggest differences between traditional and digital literacies is that we are all now a part of an open dialogue. Unlike in the past when we depended upon others to provide content for us, such as book publishers and media producers, these days we are all a part of the creation of content. There are many ways to creatively engage with content, to add back to the online community. This can include anything from posting a tweet, creating an image, writing a blog post or recording a podcast. What is interesting about consuming online content is that unlike reading a traditional book, there are many ways of going about engaging with the Internet. For example, some may not use applications like Pocket to store content for later, while others may not necessarily create their own new content, instead continuing the conversation by commenting on blogs rather than writing their own. In the end, everyone has their own way of doing things, their own personal work flow, and that is what makes it all he more so special. I love reading books, but I also love reading online. In my view, we don't give enough opportunity for this in schools. As +George Couros suggests, "Whatever you are looking for online, you will find it." I think that the big challenge is what we do with dearth of information, how we choose it, how we sort it, how we manage it, that matters in the 21st century. Instead of getting students to always close their laptops or put their iPads to sleep during reading time, maybe we need to give more opportunity for them to develop their digital literacy, to stumble upon new ideas and information, to critic it, to share it and to remix it. So how do you help students develop their digital literacy skills? Do you allow them to stumble upon information or is their time online more structured? Would love your thoughts in the comments. What Came First, the Movie or the Book? PLN, a Verb or a Noun?